For more than 500 years, the Vienna Boys Choir has delighted and thrilled listeners of all ages. The world-renowned choir is scheduled to perform in Clarksburg, West Virginia, on Saturday, March 30, 2019, 7:30 pm, at the Robinson Grand Performing Arts Center. Called “a world treasure, not just an Austrian one,” their program includes favorite Strauss waltzes, classical masterpieces by Mozart and Haydn, as well as folk songs from around the world. 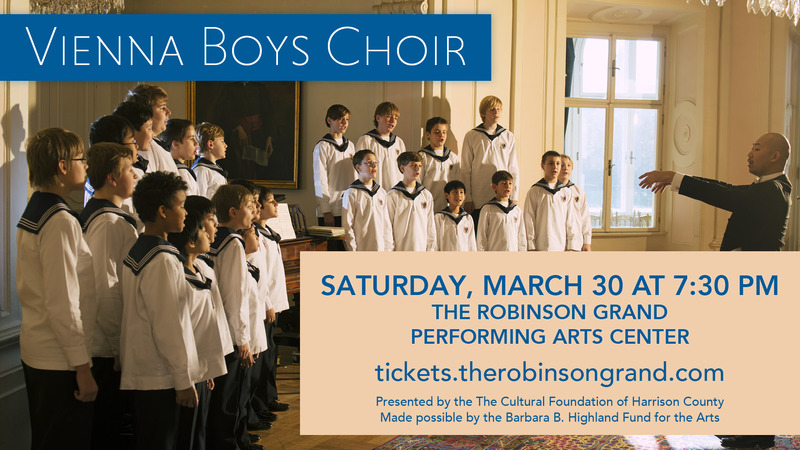 Purchase your tickets now for this legendary performance by the Vienna Boys Choir. The event is sponsored by The Cultural Foundation of Harrison County and is made possible by the Barbara B. Highland Fund for the Arts. Tickets are available through The Robinson Grand Performing Arts Center in Clarksburg, WV, at: https://tickets.therobinsongrand.com. Boys have been singing at Vienna’s Imperial Chapel since 1296. In 1498, Emperor Maximilian I (HRR) moved his court to Vienna, thus founding the “Hofmusikkapelle” (Chapel Imperial), and the Vienna Boys Choir. Over the centuries, the Viennese Court attracted musicians like Heinrich Isaac, Johann Joseph Fux, Christoph Willibald Gluck, Antonio Salieri, Wolfgang Amadeus Mozart, and Anton Bruckner; Joseph Haydn, Michael Haydn, and Franz Schubert were themselves choir boys. Until 1918, the boys sang exclusively for the imperial court. In 1924, the Choir was reestablished as a private organization. Today, there are 100 choristers between the ages of nine and fourteen, divided into four touring groups. Each spends ten weeks of the year on tour. Between them, the choirs give around 300 concerts each year, attended by almost half a million spectators around the world. Since 1924, 2,499 choristers have sung over 1,000 tours in 98 different countries. The boys’ first tour of the USA took place in 1931, their first world tour in 1934-35. On Sundays, the Choir performs with the Vienna Philharmonic and the State Opera Chorus in Vienna’s Imperial Chapel, as it has done for 520 years. In 2012, the Choir opened its own concert hall, MuTh. The state-of-the-art facility is hugely popular. The repertoire includes everything from Medieval to contemporary works. The Choir performs with major orchestras, conducted by the likes of Zubin Mehta, Riccardo Muti, Christian Thielemann, Michael Tilson Thomas, Simone Young. Highlights included appearances at the Vienna Philharmonic’s New Year’s Concert. In 2012 and 2016, the boys performed under the baton of Mariss Jansons. 300 boys and girls attend the Vienna Boys Choir Schools. The Choir has a primary school, a middle school, and a successful High School program catering to young singers. A quarter of the schools’ alumni go on to become professional musicians. Professor Gerald Wirth, himself a former choirboy, is the President and Artistic Director of the ensemble. The Choir’s education and singing tradition is listed by UNESCO as intangible cultural heritage in Austria.